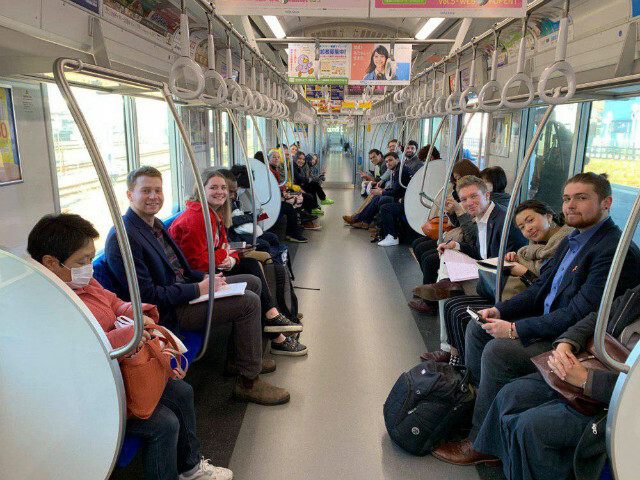 DePauw students spent the first full day of their visit at Korea University in Tokyo, where students “showed us an intellectually and culturally enriching and entertaining time,” professor Derek Ford writes. 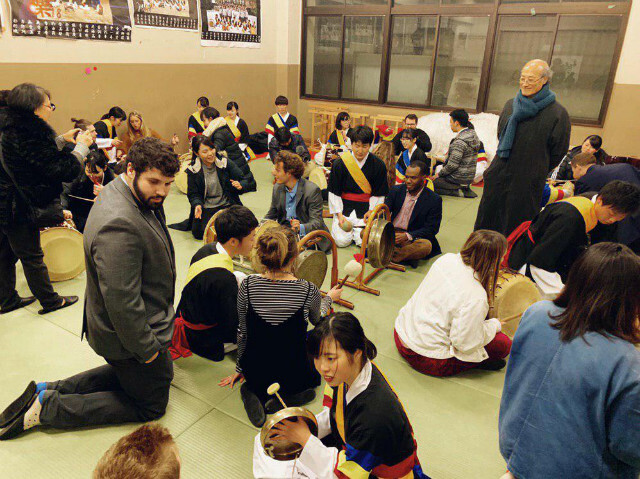 Having learned “an immense amount” of Korean history, “we are now better able to understand the continued struggle Koreans suffer in Japan,” says Jalen Friendly ’20. The winter term trip’s mission, says Lauren Schiller ’19. “is to understand their struggle and learn from their resilience. Contrary to the overall negative portrayals of North Koreans in the media, the community that exists in Chongryon in Japan has treated us with an amount of respect that is unparalleled,” she says. During our trip to Japan, the class had the incredible opportunity to visit Chongryon, Korea University, historical landmarks and memorials of Koreans in Japan as well as the beautiful city of Tokyo. Each day of our trip professors from the University guided us throughout the day along with students from the university. Although the majority of the information was provided by the professors and guides at each specific location, the students who sat next to us on the bus, walked next to us during tours, and ate meal with us had the greatest impact on myself. 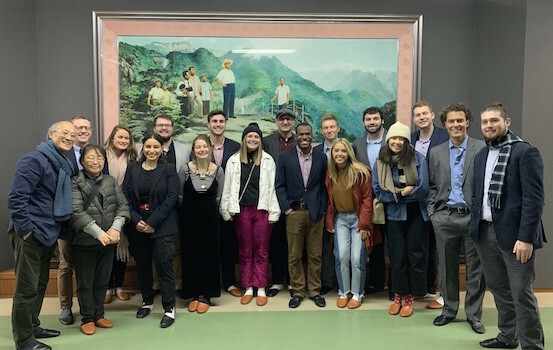 Spending a week with a group of students who embody the Juche philosophy was truly an eye opening experience for myself and many member of the class. During the entirety of our trip we were welcomed as comrades and fed like kings. The students took time from their busy days to spend it with us as well as engage in meaningful conversation were we began to realize their struggle, but more than their struggle their passion for change and for the reunification of the Korean peninsula. We spent a week with students from Korea University. Each day we went on historical and educational tours and had meetings that helped us to understand the current situation of Koreans in Japan. We visited a middle/elementary school, high school, and the university and with each student that I met and class that I stepped into, I began to understand the struggle and the motivation that Koreans have to continue fighting for justice and reunification. I saw a community of people of all ages working together to sustain and promote Korean culture. I saw that the discrimination by the Japanese government hinders them from flourishing in ways that they are capable of, but the resilient hearts in the community see right past the discrimination. I felt extremely welcomed into the Chongryon community. I felt empathy toward students who were discriminated against and I felt impassioned to change the negative perception that Americans have of North Koreans. I feel extremely grateful to have been exposed to such a unique and passionate group of individuals, and I feel hopeful that they will soon achieve their goals. Getting to tour Korea University was something I never thought I would be able to do. The pride and kindness of the students was immediately shown the minute we stepped off our bus each time we arrived on campus. Students eagerly ready to converse in a language that was not of their first nature. We were able to see the natural and historical museums within the school that gave us a sense of what Korea is like. The array of plants, rocks, and animals allowed me to understand the vegetation and life blooming in this land. I was so grateful to be able to tour something so sacred to the students and faculty. Not once did I ever feel unwelcomed walking through the campus, eating at the dining hall, or sitting in watching a class. I was able to see how much these students on this campus respected one another as they all looked toward the bigger picture. Reunification. Each classroom is simple with natural colored walls and a picture of Kim [Il Sung] and Kim Jong-il hung in the front of the classroom above the blackboards. The lunchroom stretches wide with tables intertwined with male and female students. Some of my favorite interactions sitting at lunch getting to eat authentic Korean dishes sitting with my new Korean friends. Genuine conversations about our lives and what we aspire to do with them. The overall love, generosity, and guidance given to us was something I will truly cherish and take back with me in the states. Not only this, but the overall respect and knowledge shared within this school was motivating and will impact me to keep looking toward the bigger picture with them. This tour gave me an opportunity to completely reconstruct how I understood the experience of Koreans in Japan. Before this opportunity I had only understood Japanese colonialism from a U.S. centered perspective, disconnected from and disinterested in the details. 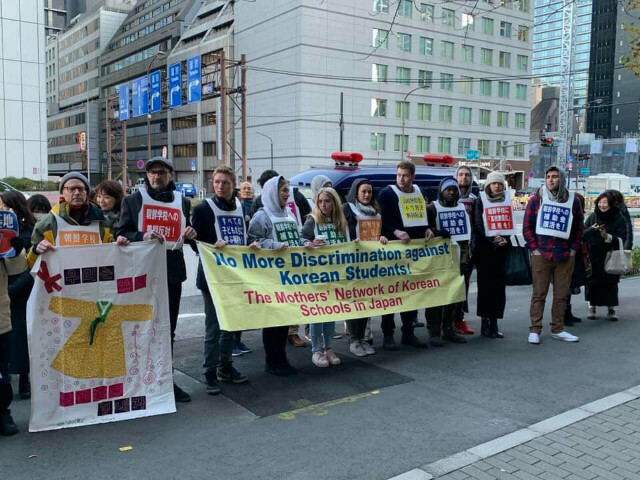 The limitations and inadequacy of my understanding I developed through the U.S. Education system and publicity was illuminated when I met the Korean people in Japan for myself. Everything from the small, everyday conversations with students to the trips to historic locations of struggle were impactful and meaningful experiences that I treasure. I am inspired and left speechless by the determination, resilience, and persistence of the Korean people living in Japan, and the oppression they have struggled against. In the end, this trip was more than just a study tour, this trip was a profound experience that gave me a chance to see the world from a different perspective. I cannot express how grateful I am to the people of Chongryon and the students and professors of Korea University, for allowing us to enter their home and displaying the beauty of their culture, the hardship of their struggle to survive, and their willingness to welcome and show love to complete strangers. 이렇게 미국의 학생들에게 동북아 역사에 대한 새로운 깨달음을 갖게 하는 프로그램들이 많아지길 바래 봅니다. 수고들 하셨네요..